In early December, at the same time as the "race prep/speed" portion of my Houston Marathon training was getting started, another appealing challenge began. My masters group, the Lakewood Dawgs, started their annual Dawg Days of Winter challenge: 12 days of swimming over a 2-week period. There was no question about whether I would take part in it. This was my biggest year of swimming so far, and I was up for the challenge! I just love swimming, swimming's my favorite! Awesome silly selfie taken by Whiting. The swim challenge was fun. Each day had a different theme, sort of like the 12 days of Christmas. For example, day one was "an endless set of 50s, free" (yes, sing along to the tune of "a Partridge in a Pear Tree"). I learned immediately that the actual challenge of Dawg Days was to get up and swim at 5:30 a.m. masters for 6 days a week for 2 weeks. With 4 days left in the challenge, I felt smug about being disciplined enough to get up so early in the morning every day to swim. But I was also feeling a little tickle in the back of my throat. As the day progressed, a cough developed, and I called Dawn to ask for her advice about whether to do my scheduled run that day or to skip it. Dawn asked me, "well, what matters most to you? The swim challenge or the marathon?" I answered without hesitation: the swim challenge, of course! And I skipped the run. I felt worse the next day, but still showed up to swim, commiserating with other swimmers who confessed that they weren't feeling great either. I showed up to swim the next day, and skipped that day's run as well. Eventually I couldn't argue that I was "getting sick" anymore. I had a really bad cold that was moving into my chest. I finished the swim challenge and earned my Dawg Days T-shirt, slept for 3 days, and skipped a total of 9 days of running. It took more than 3 weeks to completely get rid of the cold. Marathon weekend rolled around a few weeks later. I wasn't feeling confident about the race, but I figured I would see what I could do. Houston is a special race for me, especially this year living far away from my family. 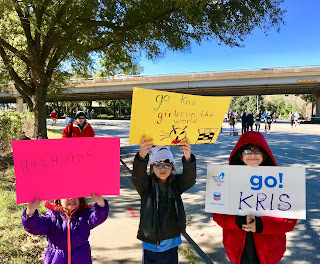 I was so excited to get to meet up with them in Texas and run this race for a third year. The Expo displayed shirts from every year of the race's long history. 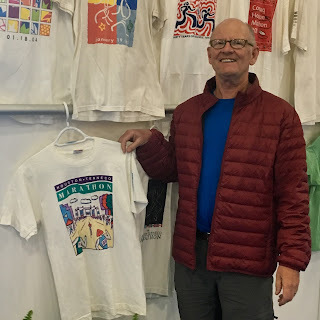 Here's Dad with the shirt from his race 1989: he still has his shirts from both of his Houston marathons at home. My awesome nephews and niece - these kids actually enjoy spectating marathons. I'm assuming one (or more) of them will keep up the family tradition and run this race someday. On race day, I tried to hold a "moderate" pace at the beginning of the race, but even that felt too hard. I backed off the pace, and as the wheels fell off around mile 14, I thought about that conversation with Dawn. I had picked swimming over running; I had made my bed and now I was lying in it! If I had quit the swim challenge and given myself a chance to rest, I probably wouldn't have gotten so sick, and my performance at the marathon would have been much better. As I plodded along, my pace slowing, I grimly remembered my answer to Dawn's question. I ended up with one of my slowest marathon times in recent years, a 4:32, and although my legs were hating it, I enjoyed the day. I loved seeing my family on the course and all the volunteers and spectators who had come out to experience the day. 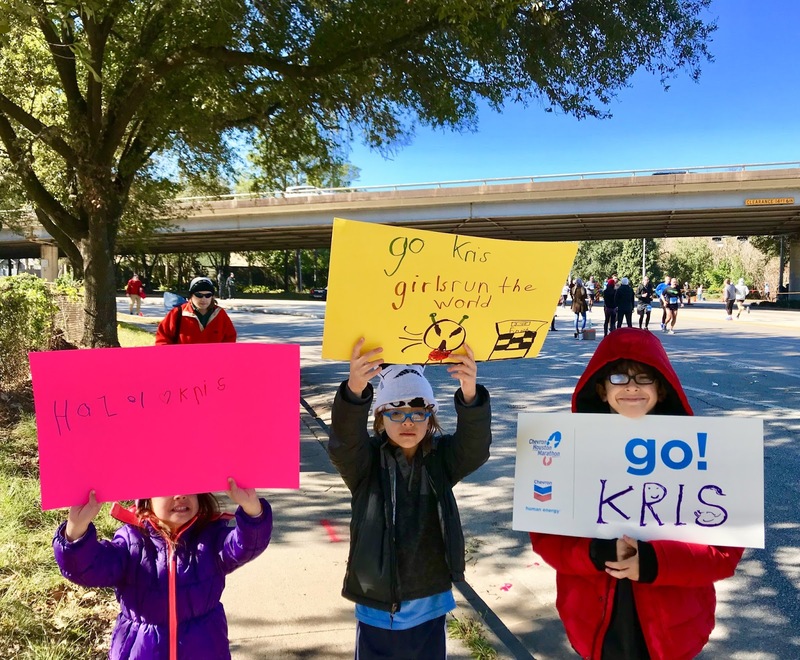 After Houston's difficult year, the city was displaying strength and resilience in celebrating their marathon, and I was grateful to be a part of it. Faking happiness for the sake of Mom's camera. That being said, until today, I've been feeling uncomfortable about my fitness based on that marathon time. Am I just getting old? Am I slow now? Do I just need to make peace with that? 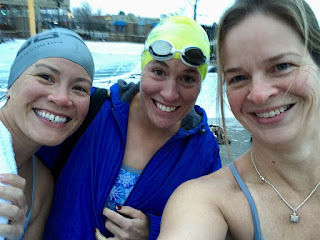 Today, I went for a swim with Whiting and Maggie, my two super-swimmer Boulder friends, and I was so happy to hit my paces on a challenging 4000 meter set. I beamed when Maggie and Whiting complimented me afterwards about how much my swimming has improved. The weeks and months of high volume swimming that I've been doing since September and the 12-day challenge in December have paid off. I gained a little bit of confidence today. 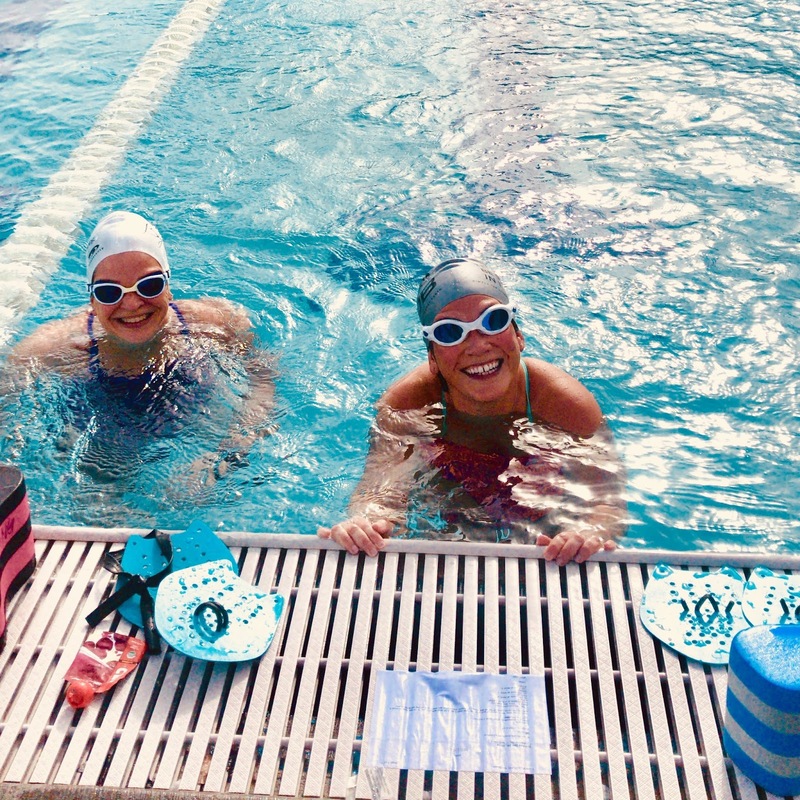 My amazing swimmy friends Maggie and Whiting at our New Year's Eve 100x100 swim. 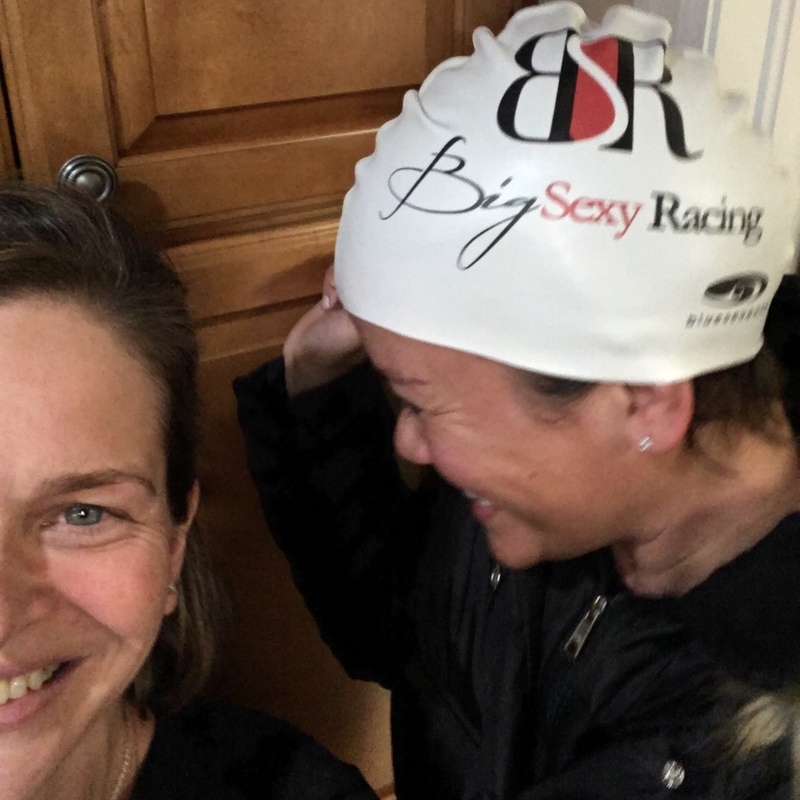 Happy swim today with matchy matchy paddles, Whiting and I are training for our first SwimRun race. I'm always excited to see what the lesson is, even if I don't like how it feels at the time. This year's marathon provided a lesson in making decisions and living with the consequences. 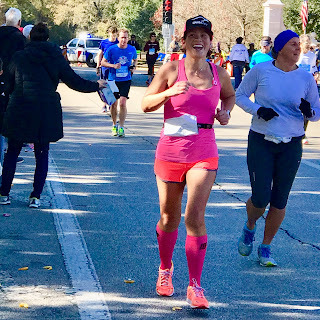 My goal wasn't really to have a fast marathon, it was to keep up my swim and run volume through the winter to get ready for the next season of swim/run races and trail runs. Even though it would have been really cool to have a fast marathon too, I couldn't have it both ways. I'm grateful to have a mentor who asked me the right question and forced me to be honest. What matters most? Answer that question honestly and you're halfway there.